"The Love of Learning, The Sequestered Nooks, and all the Sweet Serenity of Books"
Cooking Techniques, Easy Recipes, Nutrition info, Gardening Tips, Fun Children's Fictional Stories, Pet Buddies - Dog & Cat Stories, Contemporary Adult Fiction - - - it's all here. Get Comfy - stay awhile and browse. My name is Donna and I love spending time in my kitchen cooking up meals for the family. I also enjoy spending time outdoors planting vegetables in my garden. Now that I'm retired, I have a bit more time to devote to these pleasures. I also have a passion for writing. My work as an author spans across several genres including fiction and non-fiction. Cookbooks, Gardening Books, Fun Children's Fiction, How to Books, and Contemporary Adult Fiction are current works while I'll be attempting to expand into the genres of poetry and ya fiction in the near future. I hope you will stay awhile, make yourself comfortable - check out my books and visit my blogs where I'll be sharing some great recipes, cooking techniques, nutrition information, some interesting fun gardening ideas for kids and adults, as well. I'll be giving a glimpse inside my children's books on one of my blogs, I hope you will check that out . I'll also be sharing news about a cause near and dear to my heart on my blogs called Dog with a Cause and Cat with a Cause. A very interesting section of my website will be my interviews with other authors who will share interesting facts about their lives and their books. I'll also be interviewing various other people - to keep the mix interesting. All of "My Blogs" are conveniently accessible by simply clicking on the "More" Icon on the top menu bar of this page - a drop down menu will take you to any of the blogs with just one click on the title. Please feel free to leave a comment or question about anything you see of interest here. Thanks for stopping by! I hope you'll come back and visit - often! 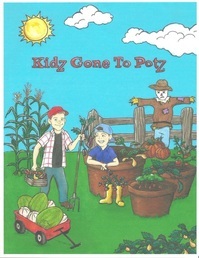 KIDZ GONE TO POTZ IS A WHIMSICAL GUIDE TEACHING CHILDREN ALL ABOUT FOOD – FROM THE GROW POT TO THE COOK POT. DIRT, BUGS, AND WORMS PROVIDE THE ENTERTAINMENT WHILE KIDS ARE LEARNING SKILLS THAT WILL SUSTAIN THEM FOR A LIFETIME. Everything you'll ever need in a cookbook. Recipes spanning 100 years, Cooking Techniques, Dry/Cold Storage Charts, Food Safety Rules, Substitutes, Homemade Mixes, Shortcuts, Kitchen Hints. Teen/Tween Kitchen Boot Camp and Super Simple Recipes!